Having a well-built online site is all right. But it doesn’t have to stop with countless web pages of appealing content both written and visual. Why not give your readers and visitors a chance to reflect on what your site is about and have them be acquainted better with you? In this case, you can put up a forum. It’s fun to cater to a community who wishes to exchange thoughts and views about the content on your site. Good or bad, it helps to know what your audience is thinking about just so you can tailor your website more to their liking. bbPress is the saving grace for those whose forum is always subjected to intolerably low speeds and is a constant victim of hacking. 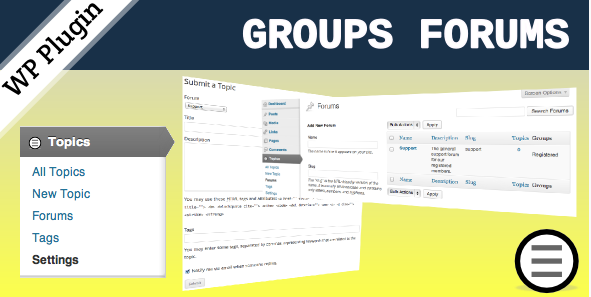 Truth be told, it is the best solution for integrating a forum into a WordPress site. It is especially known for its easy usability, web standards as well as speed. Apart from being small and light, it also allows for great add-on features thanks to WordPress’ massive plugin system. It is also available in 11 languages to compensate for those whose first language is not English. A host of amazing features and an easy installation and configuration makes bbPress one of the best WordPress forum plugin. Registered members can create their own profiles, make connections, have private conversations, create and interact with groups and more. It has all of the necessary social media components that is suitable for any niche like for a company, school, sports team and so on. Sometimes answering every user’s question in the comment section can be quite strenuous and time-consuming. That’s why Sabai Discuss is just about the ideal question and answers plugin that is built to relieve you of that stress. It has the ability to allow users to post questions and answers similar to what Stack Overflow and Yahoo Answers have to offer. Filter questions and answers by custom fields. A completely responsive and flat design. Post questions and answers from the frontend. Create search and filter options with visual form editor. Post comments to both questions and answers. Post and edit comments inline. Simple Press is one of the best WordPress forum plugin that allows you to craft either a small forum or a robust public arena. What’s more is that it is really light, fast and simple to use. 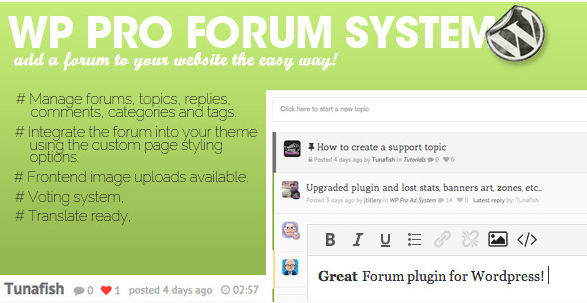 The themes and templates let you customize your forum exactly to your liking. Add that to the fact that you will even have access to an extensive plugin library and its solid plugin structure allows you to make more out of your forum site as you want. Similar to Sabai Discuss, users can post questions and answers in a stack overflow format. It also includes, moderation, voting, access control, notifications and upload files in a discussion board manner. As such, users possess full moderation access of questions and answers, restrict user capabilities as well as create multiple forum categories. This means that admins can customize questions and answers, filter out any unruly content, monitor the actions of users in the forum and add answers. Other features include private messages, multiple file uploads and receiving notifications whenever there is new content. If it’s a clean and user-friendly forum you’re looking for, then the WP Pro Forum System is at your most humble service. It has the power to give you a powerful and incredibly professional looking forum/helpdesk with the greatest of ease. Even though the forum has been made to work on the frontend of your site, admins can manage all of their topics, replies, forums, categories and tags from the admin admin area. The name of this plugin should be enough to tell you what it’s all about. However, it can give each site on the Multisite network a simplistic tool to help them create their own forums, which can be embedded into any page or post. You can also add posts and pages to the entire multisite. Very Simple: In only a few clicks, you can add a message board to your site and then encourage community participation. You can also include a title, a small description and set basic styling options. Expand Pro Sites: This plugin consists of Pro Sites integration. You can restrict the number of forums a site can have depending on the subscription level and also add value to premium memberships. Powerful Multisite Features: You can give each site the ability to create their own forums. So there you have it! All of the best WordPress forum plugins that are out there today. Now you can give your users and visitors the convenience of talking out their feelings, encourage suggestions and the like. If there’s any that you think needs mentioning, do hit me up in the comment section below or email me. The post 8 Best WordPress Forum Plugins in 2019 appeared first on WPblog.